Nestled within a cosy suburban district in Iwakura, within the Aishi Prefecture, Japan, lies today's gorgeously inspiring home. 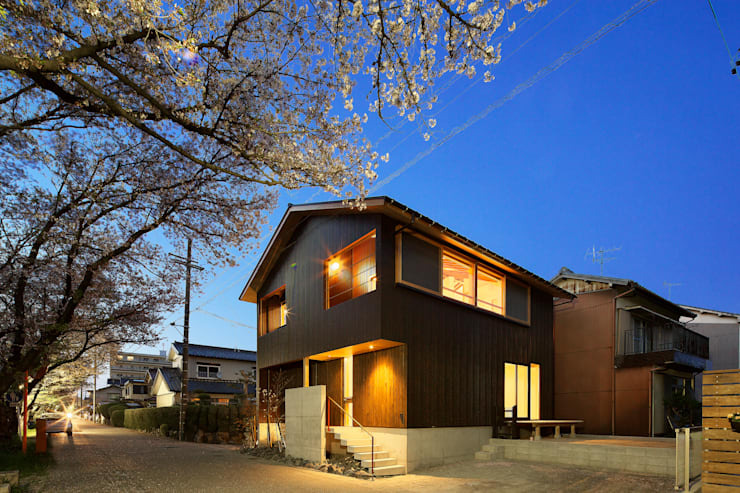 The two storey timber-framed dwelling sits enviably along the Gojō-gawa River, known for its unending lengths of cherry blossom trees that light up the region with bright pink flowers during spring. It is these flowering trees that have inspired some of the architectural features within the home. 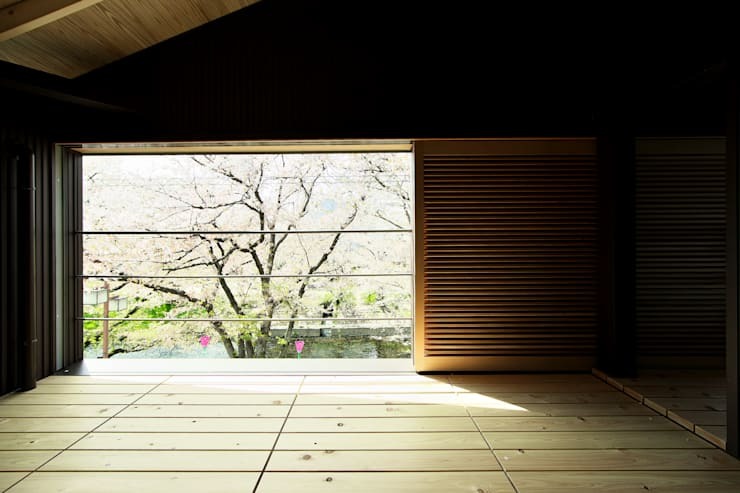 Ample window space has been included in the structural design of the abode, maximising the view of both the lively river and delicate blossoms. 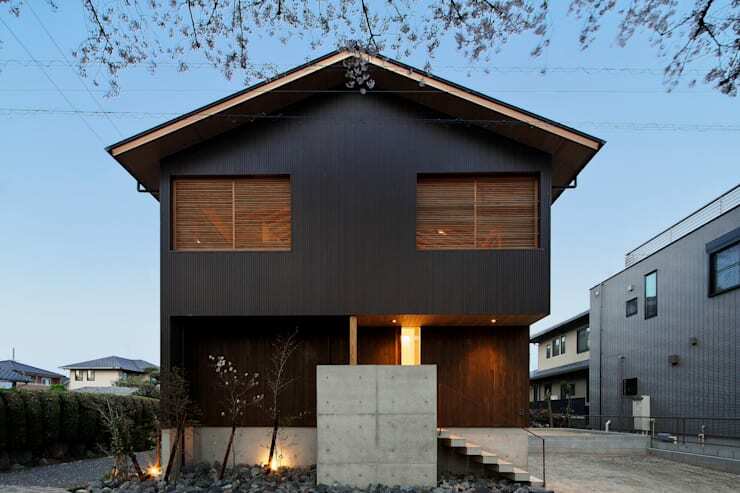 Designed by the team at Goto Hisayoshi Design Office, this is an unforgettable and bold home that is sure to impress. Inside the home and out, many different textures and tones have been employed to create an intriguingly unique residence, with an appearance that is inviting and also warm. The 146 square metre dwelling comes replete with standout characteristics such as vaulted ceilings, timber-clad interior walls, open-air living room flooring, and solid oak building components. The overall feeling within this house is one of restfulness and serenity. It has been designed with tranquillity in mind, as a space for reflection and comfortably domestic life. If you would like to take a peek inside, check out the images below, and obtain some Zen-inspired ideas for your property today. As we first set eyes upon this home we are struck by its bold colour scheme and combination of different textures and tones. The exterior of the home is clad in a dark, almost black, charcoal hue that works in conjunction with the dark mahogany coloured timber. In contrast to this, concrete has been poured as the foundation of the home, as well as the entrance steps and fence. With a shallow pitched gable roof design, the property mirrors other more traditional homes in the area. Additionally, in this image we can see the cherry blossoms overhead, which match the juvenile variety planted in the front garden. Moving closer to the entrance of the dwelling and the use of different textures and tones becomes more apparent. 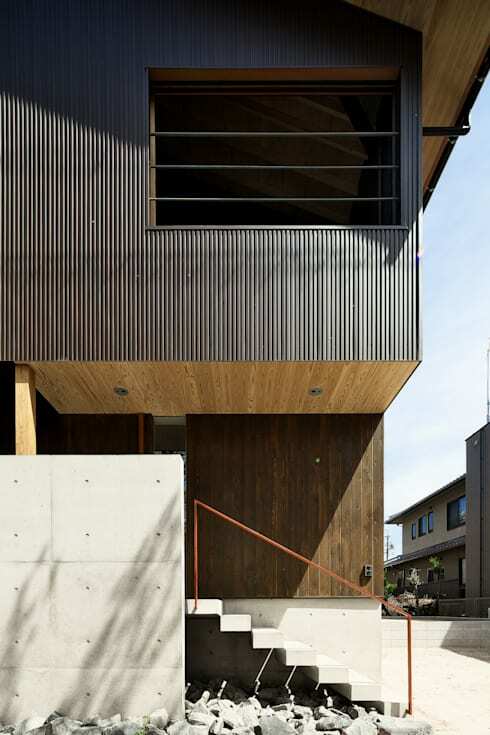 The clad façade is comprised of thin pieces that make up the overall first storey of the home, while the ground floor is a different, larger timber. Finally, the lighter timber ceiling is a gorgeous inclusion that lightens the portico, and helps bring together the two timber hues. Furthermore, the concrete pieces are wonderfully stacked atop one another to provide privacy for the front entrance, with a modern balustrade adding to the minimalist appeal of this home. Situated directly on the Gojō-gawa River, the cherry blossom view is unbelievable. Standing atop the porch looking down towards the street, it is easy to see why this dwelling is so special. The cherry blossoms inform the design of the home, and add to the delicate sense of wonderment and style within each room. Additionally, the babbling and gurgling river is a lively addition to the property, adding Zen-tranquillity within the house. Within the main living area we see the space split in two by a timber column. The different living zones are easily definable, yet share a sense of cohesion and movement. A vaulted ceiling adds roominess and architectural merit to the home, maximising the sense of light and space within the residence. 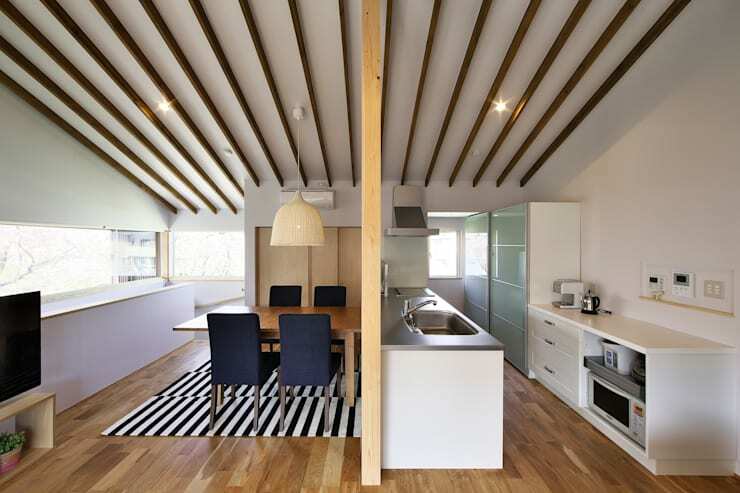 Medium timber floorboards are added to coordinate with the timber beams in the ceiling, while the kitchen is a bright white colour palette, oozing modernity and a contemporary ambience. Turning around and taking a peek at the room from another vantage we see the living space in more detail. Here the large modular sofa can be seen, with the television that services the large space. The room is light, bright and extremely well-illuminated from the abundant windows. The vaulted ceiling adds to the overall spaciousness of the room, imparting a sense of freedom and liveliness. These open plan living quarters are particularity well-designed, and would suit any occupant with a demanding aesthetic sensibility. The area is sleek and striking, without compromising an aura that is both relaxed yet refined. The decked indoor/outdoor space on the first floor is a beautiful area fit for many different purposes. Large timber sliders can be moved to the side, opening up the cherry blossom view beyond, and offering an area that is ideal for both resting and socialising. Dark timber-clad interiors make the bright white blossoms outside all the more impressive, and the opening acts as a live piece of artwork for one to watch the seasons change before their very eyes. Perfect for hosting an event, or simply spending a lazy weekend reading and relaxing, this space is a well-designed retreat away from the rest of the dwelling. The timber floors are mirrored in the vaulted ceiling above, and large glazed sliding doors allow for the entire area to be opened up. 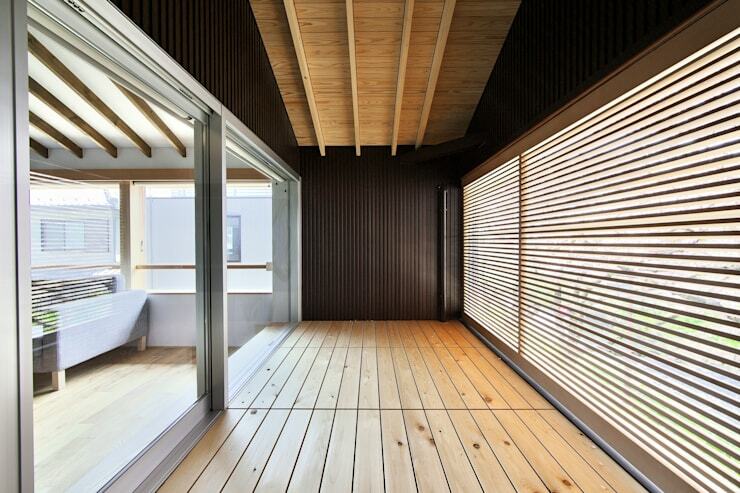 This room allows for the river breeze to blow inside, and keeps the house cool during the summer. Taking one final look at the home before ending our tour we take a look at the dwelling during the evening. This home appears warm and sumptuous, with amber lights radiating throughout the interior spaces. 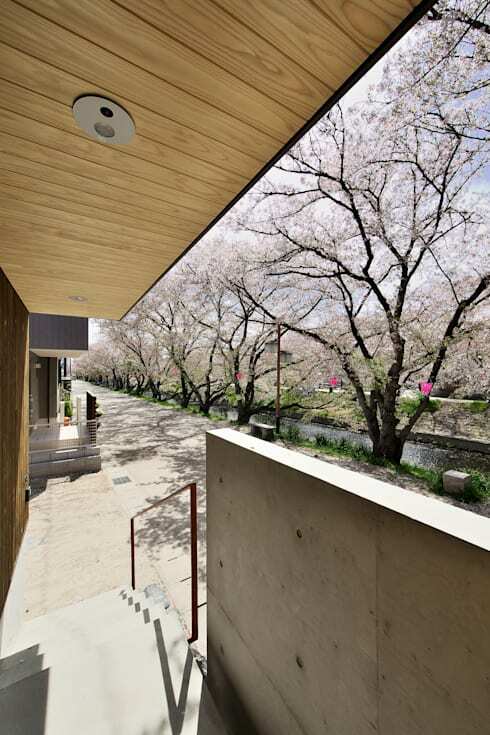 The house almost floats above its white concrete foundation, and offers a beautiful background for the impressive and utterly magical cherry blossom-lined river. 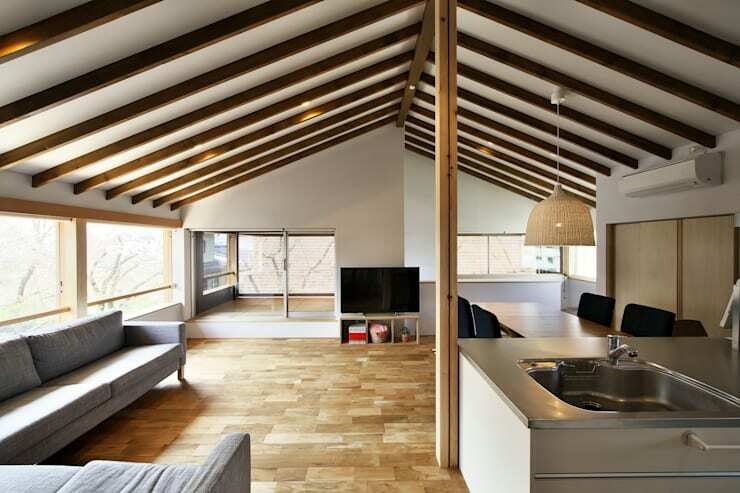 We hope you enjoyed this gorgeous Japanese abode! if you would like to see another, check out The Organic T-House.